Crystal Stone- Shaping and sealing. Erasing the cuticles. #1 Clean Pad-Removes ridges and stains. #2 Condition Pad-Stimulates circulation and brings up the natural oils to the surface. #3 Shine Pad-Uses the natural oils in the nail to produce a High Gloss Shine and protects and seals. 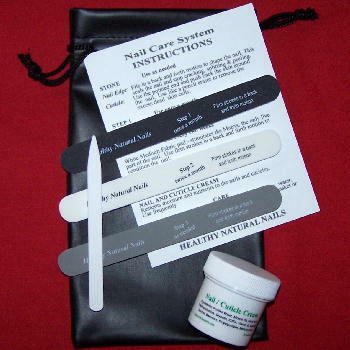 Nail/ Cuticle Cream-Re-hydrates with nutrients. Seals and protects with beeswax. Stylish pouch-To keep your kit in.